People are solicitous, asking if I want to sit. They open bottles for me and let me go first. So, for me, there’s way more positives than negatives about being smack dab in the midst of oldness. But then, I have my health. One more thing: There has never been a time in my 80 years when I have felt what I’m feeling today: utter terror that our country is being taken into a possible dictatorship, with a KGB-type intelligence/surveillence; that poor people, people of color, formerly well-paid blue collar working people, will never again be able to afford good schooling, a home, health care, freedom from violence and stress and that too many won’t even know it’s happening because they aren’t getting true news/facts. 2017 showed us—at least those of us who are still able and willing to access truthful news—that the threats to our democracy and to our environment are far worse than any of us dared imagine. The seeds of fascism are all around us. So my plea to those who follow me on social media is to harness every ounce of your abilities, imagination and courage to do all that you can, in collaboration with others, to stop the destruction of Democracy and civil society. Join others in non-violent efforts not just to resist but to transform the social and political landscape. I am doing it by working with groups on the ground in various parts of the country who go door to door, finding out what people are worried about and helping them understand why those now in power do not intend to help them. Quite the opposite. There are so many people and organizations out there working to educate potential voters and to build long-term people’s movements with the aim of establishing a vibrant, democratic civil society. We must make it possible for single mothers to earn a living wage and have access to affordable child care; do away with mass incarceration and the privatization of prisons; sexual harassment and violence against women must end; former unionized workers must be retrained for the new economy and given jobs not promises; student debt must be forgiven and schools must be improved for all young people; our public lands must be protected and all forms of extraction halted; racism must be made a shameful (and acknowledged) part of our past. There is so much to be done and all of it is possible if all of us can muster the will and determination to fight back against what’s happening. Greed and selfishness are not the pillars of a stable society so let’s be fierce in this New Year. How are things going with you and your cutie Tulea? I’m so thrilled that you answered me last time I wrote you here! I still can’t believe it! I was so emotional and when you worte that David and Jonathan had both told you about my page, that gave me life. I hope you’ll enjoy it as much as I do working on it. I’m a 17 year old (norwegian girl) who’s obsessed with all your movies and of course Grace and Frankie! Me, my mum and my grandfather (he’s 80 and he’s been a fan of yours since forever) love to watch you and Lily in Grace and Frankie. I must have watched it a million times now and I’ll never get tired of it. I’m so looking forward to season 5 and the movie Book Club. You’re such a style inspiration, I mean… your style is on fleek and you look so gorgeous in everything you wear! On my fan pages (VintageFilmArcive/JFondaworld) I post all news about you and I’ve noticed all the perfect colors you wear. So, I’ve always wondered what your favorite color is, if you have one? And how was it like to work with Diane for the first time? Thanks for you workout tapes, I now work out 4- 5 times a week which I never did before. I just love how it feels afterwards. I’ve always wanted to be a pilot because I think we need more women in maledominated occupations. Hope I’ll one day become one. Hope this wasn’t too much information at once but I wanted you to know how you changed my life and how much I adore you. Stay strong and God bless you. Ellen, let your daughter know that it tkes a lot of hard work and study to become a good actor. She should find a good teacher when the time comes. Belated and sincere birthday wishes Jane! Some of my best memories in life are going to see movies with my father who liked you very much. I love your articulate and soulful admirers who comment here. I wish I could see a panel discussion with prominent and talented women like you who have taken it on the chin by right wingers: Kathy griffen, dixie chicks, linda ronstadt, eartha kitt… people like this come to mind. Your end of the year if not hallmark event of turning 80 letter is certainly, well thought out and expresses much of where many of us are coming from at this time of life…I would think of all life regrets however, your role in Vietnam in both a political and personal sense, that for decades has left wounded Americans, Vietnam vets, still…Would be something of value to touch on specifically as I would guess? It must be your largest regret. Perhaps more needs to be acknowledged on that “front” and in the right place, in reconciling life at this point…Just a thought. I don’t think you ever intended the backlash that continues to ensue if not mar your name and wouldn’t it be wonderful to seek greater reconciliation on that matter? Our Souls At Night is such a beautifully done movie! Book Club looks fabulous, can hardly wait to see it and Grace and Frankie is still going strong with the 5th season on the way! I do hope You will write more books! Your recent comment “I have closed up shop down there” is so poignant yet told in an entertaining way! Lot of your experiences are so relatable for men also! When I met you again in London in October I wanted to say thank you for My Life So Far, when I read that book when it came out I related to many of your experiences with the intimacy issues, bulimia, folding ourselves into a pretzel and all the other parts in the book are such universal issues and by you honestly talking about it helped us dealing with a lot of it, that we are not alone! Was lucky enough to have it signed in 2006 in NY during the book tour, and meeting you again in October I was again speechless, but You were so lovely and I would like to thank you this way! Can hardly wait for seeing Book Club, looks like such a fun movie! Your instagram made me almost forget about your blog. Love your pics with your “book club” cast mates.. I hope you continue to live your life the best way you know how.. Time and age is just an illusion of myths. The older i get the more i look forward to the challenges life brings. The best way to defeat fear and anxiety is to just live and do what makes u happy. Im very curious to hear about your views this coming mid term elections and who your excited in supporting. I also would love to get your opinion on good organizations to join.. Im considering Obama for America to work this coming election year.. I know your very involved in grassroots orgs and national ones. So im curious to know where i could offer my services. Sending love & blessings your way.. Hope i can def meet u soon. My name is Tim. I’m 20 years old and I live in Russia. I just admire everything that you do. I rewatched your entire filmography several times already. Grace and Frankie literally stands on the repeat. I really want to know about your impressions of Russia during the filming “Julia” and also ask about your possible visit to our country again. Thank you very much for everything! Jane, many years ago I shared a taxi with you from the Vassar Campus to the train station in Poughkeepsie. I was a freshman, you were a junior. You wouldn’t have known me, I was Lynn Henline then, but of course, everyone knew you! Do you by chance remember Mr. Christie, the English teacher with a prosthetic hand covered with a white glove? it was 1959 and he was appalled that his students were so apathetic. There were sit ins at the Woolworths in Poughkeepsie but they might as well have been on Mars for all we cared. I even missed hearing Robert Frost when he came to campus because I had a test the next day. Like you, I have been married and divorced. I have been widowed, and remarried. Like you, I have become something of an activist. I was at Standing Rock, I closed my account at Wells Fargo., etc. I got arrested for protesting the First Gulf War. I participated in demonstrations with Ron Kubic, supported the Palestinians, and the like. However, I am writing to you now to thank you for the wonderful speech you recently gave on racism, from a white woman’s perspective. I have reposted it everywhere I can. There is currently a wonderful performance of Richard Wright’s Native Son in Glendale. I am quite sure you would as moved as I was. Thanks again, Jane. We have come to share so much more than a cab ride after all these years. Hi Miss Fonda, my name is Alejandra, I’m 18 years old and I want to thank you for inspiring me to workout, I used to hate exercising but thanks to your workout tapes I have lost a lot of weight and I feel so much better with myself and now I love working out . You have become a role model to me because you always stand for what you believe in. I want to be a great actress like you (btw I have seen almost all your movies, and your terrific in all of them! My favorite is Klute) is there any advice you can give me?. LOVE YOU SO MUCH! thanks for helping me to be a better person. I was listening to your comments about being 80 and your reflection on life. WOW! 80 is certainly serving you well. I also want to reflect to the first time I did your original workout in the 80’s. I was an overweight high school guy and dove right in. The pounds shed quickly. I knew you only as an actress and activist at that point (and also 9 to 5 was and/is one of my all time favorites). I learned to love your workouts and was so excited when the New and Improved Workout was released. As I was trying to identify with myself and loose weight, your workout was a comfort zone for me. I eventually purchased the vhs tapes once I saved up enough allowance money and added them to the mix. I met you briefly at a book signing in San Francisco while you were promoting My Life So Far. (fantastic book also). I wanted to tell you how much you have changed my life but didn’t have the opportunity. You have changed my life. I was going through some belongings a few weeks ago and prompted me to post this. I ran across letters from the Jane Fonda Workout as responses to letters I had written. I would write to the Workout in hopes of obtaining merchandise (which I did) and letting you know just how effective those workouts had been. My gym teacher asked “How did you loose all of that weight” (about 25 pounds) or so. I responded “Jane Fonda Workout”. She asked me to bring the tape to school ( I had the album and tape so in case one broke I would have back up). She said if it worked that well, the Physical Education classes would all be doing it too. You have truly been an inspiration to me! I appreciate all you do as an actress, activist, and fitness expert. As a fitness instructor, I hope that my class participants will have that same inspiration from me. I can only hope! To this day I still use some of the many Jane Fonda Workouts when I’m at home and just want a change to my workout or need to hear the comfort in your voice-it certainly brings back fond memories 30+ years later. Thank you, Jane. P.S. If you decide to do another fitness video, please count me in! I would be absolutely honored! Jane, I seen Book Club tonight and LOVED it! You and the ladies were phenomenal, per usual! I imagine you have a lot of fun on any set, whether it’s for a movie or a tv show but which do you most enjoy making out of the two? How are you? I’m only a little nervous but I’m fine, everything’s fine. Yes, hello. I totally didn’t write down what I wanted to say on paper first. But I totally did so I wouldn’t sound ridiculous, which I hope I don’t already. Anyway, I have a couple questions. 1) Is there or has there been an actor or actress that you’ve worked with that intimidated you? 2) What was the best piece of advice Katharine Hepburn gave you? 3) I know I’m probably three years too late but, did you get to see Carol when it came out? If so, did you like it? You are the most amazing woman I have ever come across. I have so much love for you, you have helped me so much (I suffer terribly with anxiety and depression) just watching Grace and Frankie, or any of the movies you are in or any of your interviews just always calms me down and makes me feel a whole lot better. I got put on anti depressants a few weeks ago, it just got to that point where I needed that extra help and kick. I know a lot of people out there have it so much worse but life has been so hard, it isn’t easy for anyone but everyone handles things differently and last year I almost gave it all up and almost ended my own life but I got scared as one of my biggest fears is actually death and thought THIS IS NOT THE WAY and I couldn’t do it to my family & friends. Jane, you have taught me not to give up and how to be strong and to fight away the dark and horrible thoughts and not to be ashamed of my mental illnesses, I can’t thank you enough you don’t know how amazing you truly are. I have ordered your book My Life So Far and I can’t wait to read it I have been told it is brilliant and I don’t doubt that one bit and also Being a Teen. I will be getting Prime Time next. I really hope you see this, I had some trouble for a while trying to create an account on here but some other Jane Fonda fans helped me out on Twitter now I here I am! Also again because of you I have made such wonderful friends online I have just been so happy recently, happiest I have ever been. I love you so much. P.S will you be coming back to the UK again in the future? I am from Wales and I would really like to meet you one day, would be a dream come true! Thank you so much for getting back to me. Once again you have made me so incredibly happy, and thank you so much for the kind words. My mother also takes Prozac and she said exactly the same thing. I take Citalopram and they have made a massive difference for me. I would just like to ask you one thing, do you have any tips for me to increase my confidence? I hate how low my confidence is, don’t get me wrong my confidence is a lot higher than it was but still ain’t how I want it to be and I have no idea what to do about it. Can’t wait to hear from you again. Also sending you love and thoughts. I know this probably isn’t gonna have to do anything with this blog, but first, I just wanna say, wow! You look so good at 80! I just wanted to tell you that I talk to you about my friends all the time, as weird of that sounds. I do it because you make me one of the happiest people, even though we’ve never met. You are such an inspiration to me. Every time someone has something negative to say about you, I give them many reasons why there’s no reason to be negative about you. I have a quotation, there’s this girl, named Melissa (she commented on this blog as well) & I think I may be catching feelings for her. The thing is, we’re in two different states, & have never met. What do you think is the best thing to do? I hope I ge the chance to meet you, soon! By the way I act like Grace Hanson. So I guess you can say I’m a mini Grace Hanson! Just not pretty like her. Have a wonderful night, & remember I love you with all my heart! Is there some places you’d like to visit that you haven’t visited yet? Please come to Norway, your fangirl would LOVE to meet you! Love Norway. Made a film, “Doll’ House”, there in 1972–in Roros.Not sure I spelled it right. You said that you were intimidated by working with Marlon, that was in The Chase, what’s your strongest memory about that experience? I know you had more scenes with Redford in that film, but still I bet you hang with the cast and the crew on the set. I wonder have you ever discussed with Brando about his mother and her influence on your fathers acting path? Marlon was a complex as a person, what do you think about him in general? Also I wanted to ask you about another actor you worked with. Anthony Perkins you two were so cute as a couple in Tall Story. What was he like? I loved seeing you play “Nora” in A dolls house. Such a great movie. I remember I read the book (a couple of years ago) which is called “Ett dukkehjem” in norwegian. I’m so glad you liked Roros and you spelled it just perfectly. I also read an article where you told that you’ve visited Sweden a couple of times and Norway once. You stood up during the Swedish election campaign. I wished I was alive then so we’d be in the same country. It makes me so happy as a fan to see your answers. Thank you Jane! other girls at our workplace exercised with me 3 or more times a week – a heaven sent because I had fought to stay fit since then. Consequently, gaining reliable leg strength and balance had prevented me from several “would-have-been” accidents if not for my Jane Fonda workouts and aerobics sessions that have ‘centered’ me and have strengthened my core. I have escaped many ‘falls’ and I always say “thank you Jane ” each time. I want to thank you personally, and I am planning on living to a 100 and declaring your name on my 100th birthday. 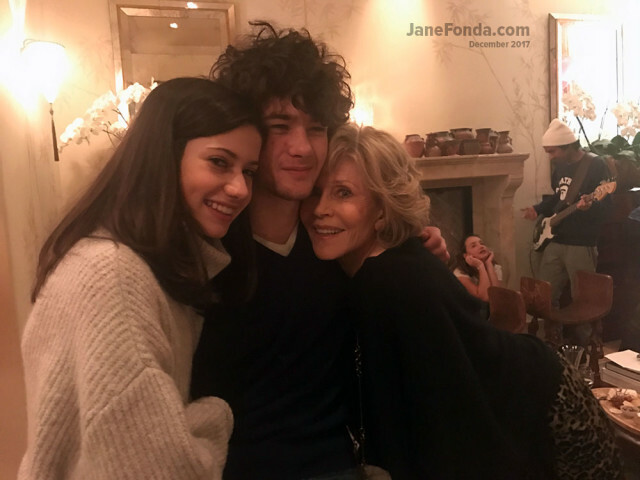 More power to you my forever fitness ‘guru’ and digital pal, dearest Jane Fonda! You are, and always will be my fitness and strength touchstone. I love your new series on Netflix, Gracie and Frankie, it’s so much fun to watch and brings me so much joy! Gracie loves her cocktails, and so do I, and I was wondering do you like to drink alcohol in your real life? I think it’s good in moderation. Also, are you in monogamous relationship? I am, but I’m not sure if I want to move with him right now, he is 71 years of age, even though that is what he wants. Anyway, please keep up the great work, I find everything you do so inspiring. Carol. I left my last relationship 11/2 years ago and I’m living alone and loving it. I was married 3 times and was monogomous. I do drink time to time but less than before because I;m too tired the next day even after one drink. Prefer vodka to wine. I’ve always been a fan of yours . I didn’t know about your blog until a few minutes ago and I’m so glad to read all your thoughts . I’m especially thankful that you take time to write and encourage us, your followers , of all ages to not just love your work as an actor but as a humanitarian , an activist and a health enthusiast. I’m a 34-year-old mother of one who just started a small business a year and a half ago and going through my days like most immigrants do in this country . What encouraged me to write this letter to you is that you expressed you want to visit Myanmar ~ my native country ! It is a beautiful country , Jane and no matter how it has been portrayed by different news outlets , one thing has never changed ~ we enjoy good films with strong femal lead and you have been one of our all-time favorite actor . So if you ever decide to take a break from your busy schedule and visit across the globe , me and hundreds of thousands of your fans are there to welcome you warmly and offer the best hospitality that we can only imagine of offering . Just remember to visit in December or January so that you won’t get too overwhelmed with heat and humidity 🙂 Last but not least , I would like to applaud you for your dedication to stay in such great shape , both physically and mentally . When my girlfriends told me that you’re 80 a few days ago after we had the best laugh of the year watching Book Club, I was really shocked .You’re in better shape than most of us combine so that alone should be our incentive to start working on healthier , happier diet and workout routine . You are an inspiration Jane . I’m sure you have days where you feel your age (I feel three times my age quite often!!) but the fact that you are embracing everything that comes with it just shows how important it is to stay alive and celebrate life with all its beauty and scars. Thank you for being the symbol of strength for many of us . With every flaw that I have , I will live life to the fullest because you have taught us through your work that it is worth it . My sister took me to see Book Club last night. Laughed, cried (teary-eyed here and there is more like it) .. Loved it! I am a 53 year old woman that has probably twice your wrinkles .. and I was honestly shocked just now to see that you are 80 years old! (I love your work but don’t do a whole lot of celebrity research so was unaware). I don’t know if you’ve had any work done but wouldn’t surprise me if you had not, you are that natural. I also just read your blog on racism. I am of Metis decent but appear very much only white .. blue eyes and all. My fiance is very black. I say “very” black, because his skin is very dark and the darker the skin the more racism experienced in his own country (Jamaica) projected by lighter skinned people (brown). What has shocked me the most is how public it is .. even in the school system. “If you’re black you’re held back, if you’re brown you can stick around, if you’re white, everything is all right” is a well known phrase there. I think of you and try to draw strength and inspiration to do more. To quit smoking so I can stop the wrinkles. To exercise to look and feel better so I can live a much longer, productive life .. to keep up with my grandchildren and be around to love them and my future husband (he’s 11 years younger by the way .. we’ve been together 4.5 years. Still spending much too much time apart .. me in Canada, he in Jamaica). And to join SOMETHING to help in the struggle against racism .. I say join as I am more a follower than a leader, rather than just sit here and think to myself how terrible it is. So, thank you Jane .. for all that you share with us. May you fulljoy your life and all it has to offer! I intend on being around until I’m 97, so I best get started! Any words of wisdom for me would be most welcome! Jane, Thank you for the book recommendations, if there’s any more you come across I would love to hear about them! I find myself not being able to put them down, speeding through them, and looking for more beyond the ones you listed. I have learned so much, it just blows my mind how ignorant I was to this huge issue and I find myself sparking conversations with friends, strangers, anyone who will listen, really. Thank you for bringing it to my attention! Two days ago was World Eating Disorder Action Day, have you heard of this? I didn’t even know such a thing existed until roughly 15 minutes ago. (I guess I’m out of the loop?) I feel as though eating disorders are very overlooked and ignored, at least from my experience. I work with juvenile girls, most who have problems with eating disorders, self harming, and so on. I don’t think kids get enough access to information and recourses to help them through these things, like I didn’t. I help my girls in the ways I know how and in the ways I’m trained and taught, but I also tell them about you, your strength, how despite it all you still smile brighter than anyone I have ever know. They are in love with your fearlessness and your resilience, as am I.
I want to simply THANK GOD and THANK YOU for having the opportunity to be alive at the same time as you, because I am learning so much from your vision on life. I am a person who also lives in the present, but I am so much more contaminated by your enthusiasm of living in the very PRESENT moment, no matter the age. I don’t know yet how am I going to feel when I’ll be in my 80s (as I am planning to :D), but I know for sure that now that I am in my almost 40s I will not go back in my 20s for nothing in the world. Now I am feeling so much more alive and closer to whom I really am. I am so much happier and focused on life’s miracles. I LOVE YOU for being so open, authentic and so transparent and also honest about how you think and feel inside. You are such a beautiful soul, inside and outside. Please, keep on doing what you are already doing, because you are such an inspiring woman!!! PS. I've just watched Our souls at night two days ago and … "chapeau bas" for the whole acting! Jane, i love watching you and Lily on Grace and Frankie. It makes me laugh every day and i have not laughed in a long time so thank you both. I am on season 3 and hope you and Netflix keep the show going . I heard season 5 is in production and so happy to hear that. Thank you all for a great show that address Seniors and their realitys in life. Take care wish you all well. I am a huge fan of you and your family. How did you end up being versatile at your age? Do you have any advice for teens out there? P.S, you were born on the same day Disney elevated Snow White and the 7 Dwarves. Dear Ms Fonda. I have recently discovered you through Grace and Frankie and have come to respect and admire your courage, intelligence and resilience. I had become withdrawn from life following my husband’s passing but after watching many of your interviews and then your Five Acts I felt that I can still contribute in some way. You have also through your exercise programs inspired me to take care of myself. Thank you. Anna. Hi Jane, You are an inspiration! A belated Happy Birthday. I am comforted by your Grace and Frankie show. Thank you ( and Lilly). Your recent special -The Femanists – on Netflix was right on the mark and incredibly validating. I am 66 and as a young woman, although my professions were different than yours, I lived through much of the same as you-as all of us woman did. I appreciate hearing your voice in the telling of this very personal history. Go for it, Mohrhoff. Do a life review. Read my next book, “Prime Time,” which has a chapter about doing one. It will help your remaining time immensely.